Do I Need to Remove Fruit from My Fruit Tree? When your fruit tree sets too many fruit, you may want to remove some of the immature ones to improve your harvest. This is a guide about "Do I need to remove fruit from my fruit tree?". Question: Do I Need to Remove Fruit from My Fruit Tree? I have a naval orange tree that is loaded down with new fruit. Do I need to get rid of most of the fruit? I know that the branches will not support the weight of more than one or two naval oranges. I also have the same problem with my lime trees. Thanks for any help you can give. 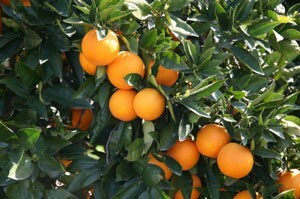 When citrus trees are allowed to bear all of the fruit they set in the spring, the results are usually less than optimal. You will either see lots of small fruits or inconsistent crops over the course of several years. Thinning the fruit of younger trees is important for good crop production, and it promotes the growth of the canopy, which produces a healthy, more disease resistant tree in the end. In order for trees to produce a good quality crop consistently, it is recommended to thin fruit clusters down to a single fruit so that each fruit hangs no more than 6 inches from the next. With limes trees, I believe 2-3 fruits per cluster is considered acceptable. In general, if you make a fist and find you can touch 2 fruits at the same time, your citrus tree needs thinning. Thinning should be done in the spring or mid-summer, after the tree thins itself naturally (also known as fruit drop). At this point, the fruit will still be a manageable size (between the size of your thumbnail and a golf ball). If you wait too long, any benefits gained by thinning will be lost. The thinning process is best done with a pruning shears or scissors. Leave the largest, most vigorous fruits on the tree and when removing the others, make sure to remove the fruit as well as the entire stem from the tree. Yes... thin the fruit!! I live in the Michigan Fruitbelt, born and bred and I'm surrounded by our own orchards. PEaches, pears, apples, cherries, apricots, pluots, and plums to name only a few, but we thin the fruit to two or three per cluster but only after what's called the "june drop" which is when the trees naturally drop some of the excess fruit. Take note: if the fruit is not thinned, it can get too heavy for the branches and cause them to split and crack and even break off. This can dammage the tree and even kill it. An excellent book for just such things is called "The backyard orchardist" by Stella Otto. We have apple, pear, plum, and cherry trees and we thin them. I leave only 2 in a cluster.